From the first bite, to the last. Our grass-fed beef speaks for itself. But we also love to hear back from our clients. Leo, a client and neighbor who has helped on the farm shares his love of Rocky Hill Farm and Beef. Why did you choose Rocky Hill Farm Beef for your grass fed beef? 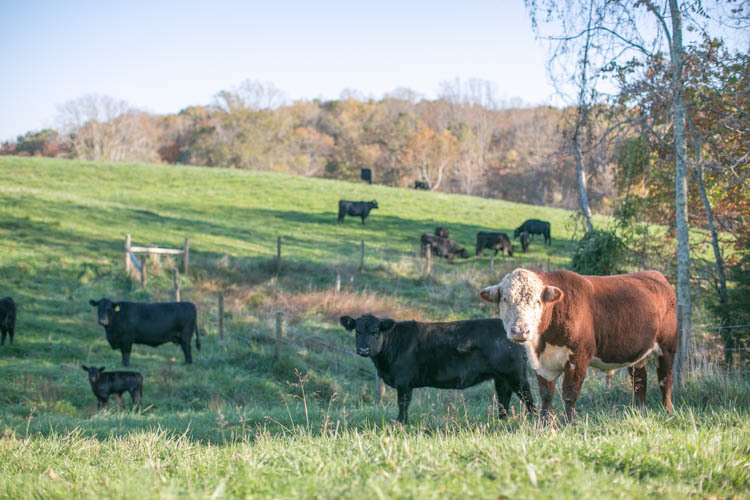 I always knew grass fed beef was healthy and delicious, but since working on the farm and seeing the beef operation from all aspects, my opinion of Rocky Hill Farm Beef is even higher. Helping Frank and Mark on the farm has shown me just how caring they are about the animals. The are raised as humanely, healthy, and naturally as possible. These are truly happy steers. What do you like best about Rocky Hill Farm Beef? Each order gives you variety of cuts and the high quality of this beef shines through from the first to the last bite. What is your favorite dish to make from Rocky Hill Farm Beef? Bacon and mushroom stuffed hamburgers on the grill. Or a simply prepared rib eye – the meat really needs nothing more than salt and pepper to accentuate the free range taste of this grass-fed beef. This entry was posted in Testimonials on March 1, 2017 by mroberts585. Winter is the perfect time for a big bowl of chili. There are countless chili recipes to choose from – beef, chicken, vegetarian, beans, etc. Our favorite combo is black beans and Rocky Hill Farm’s ground beef (of course!). By cooking with grass fed beef, you are cooking with lean beef and cutting out all that grease while still getting that amazing flavor. This simple recipe is hearty, healthy and can be ready in 30 minutes. Mix in Rocky Hill Farm ground beef and cook just until the pink is gone. Stir in beans, 1/2 cup reserved bean liquid. Mix in chili powder, oregano, cumin, and cayenne; stir 2 minutes. Then add tomato sauce. Bring chili to boil, stirring occasionally. Reduce heat to medium-low and simmer until flavors blend and chili thickens, stirring occasionally, about 15 minutes. Season to taste with salt and pepper. Ladle chili into bowls. Top off with your choice of chopped cilantro, sour cream, grated cheese, and green onions. This entry was posted in Recipe and tagged ground beef on December 29, 2016 by mroberts585. Ground Beef for the Holidays! EVERYONE KNOWS THAT GROUND BEEF MAKES A PERFECT CHRISTMAS PRESENT FOR ANYONE ON YOUR LIST! We have 1 lb packages of ground ready to go at $6.50 per lb. This entry was posted in Uncategorized on December 20, 2016 by mroberts585. Beef & Beer Happy Hour | Pickup day! Get ready for the Holidays, it’s time for beef and beer happy hour! Plan to pick up your beef and share a drink at Rocky Hill Farm and Beef Friday, November 18th, 5-7:30 pm. Beef is currently aging and being prepared to your specification at the butcher and will be picked up from the butchers just hours before the beef and beer happy hour. If you can’t make it, reach out to us and we can make other arrangements! You will receive your individual hanging weights and invoices in a separate e-mail so you can bring your check with you when we meet at the farm. Didn’t order beef? That’s ok! Come out for the happy hour and meet the Rocky Hill Farm and Beef team and tour the farm. Want to be alerted for the next order in Spring 2017? Email us and ask to be added to our alert list. Please note GPS often takes you down a farm road that isn’t friendly- better to follow these directions: From Earlysville, bear Left onto Buck Mountain Road, go roughly two miles, Right onto Robert’s Lane (at Chestnut Ridge Subdivision)- farm at the end of Robert’s Lane- drive back to the shop! This entry was posted in Uncategorized on November 7, 2016 by mroberts585. Our favorite meatballs can be dished up just about any way you like. This time we served them over spinach linguine with some local tomato sauce. Cook onions in extra-virgin olive oil in a 12-inch heavy skillet over medium heat, stirring occasionally, until softened, about 10 minutes. Add garlic and cook, stirring occasionally, until softened, about 3 minutes. Transfer to a large bowl to cool. Stir together cooled onion mixture, bread crumbs/panko, eggs, parmesan, parsley, oregano, lemon zest, salt, and pepper until combined. Add meat to bread mixture, gently mixing with your hands until just combined (do not overmix). Form meat mixture into about (1 1/2-inch balls with dampened hands, arranging meatballs on a large baking sheet. Heat olive oil ¼ cup olive oil in a 12-inch heavy non-stick skillet over medium-high heat until hot but not smoking, then brown meatballs in 4 or 5 batches, turning frequently, about 5 minutes per batch. Return to baking sheets while you cook the remaining meatballs as to not overcrowd. Add more olive oil as needed while cooking the remaining batches. Add all meatballs back to the pan* and add your favorite local tomato sauce and gently simmer, covered, stirring occasionally, until cooked through, 20 to 30 minutes. Serve over your favorite pasta! *I recommend leaving all of the juices from the cooking process in the pan. It adds flavor and you will find there is not a lot of it as grass fed beef is lean! This entry was posted in Recipe and tagged ground beef on November 4, 2016 by mroberts585. This entry was posted in Uncategorized on February 4, 2015 by mroberts585.